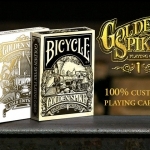 In the summer of 2014, the Golden Spike deck catapulted Jody Eklund (Black Ink Playing Cards) into the list of recognized contemporary playing cards designers. For this creation, Jody was inspired by the 1st Transcontinental Railroad in the USA and named the deck with the golden spike made for the great opening of the railroad in 1869. To celebrate the 150th anniversary of the event, the artist offers us a luxurious creation: GOLDEN SPIKE 150th ANNIVERSARY. 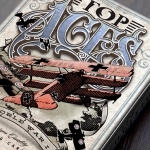 This new deck is not just a reissue with a new case but a completely new set of cards where the faces have been redesigned keeping the original “retro” style and showing the characters of this great historical moment. The rest of the elements in the deck are a parade of luxurious features: a tuck case with gold foil, an exquisite and detailed embossing and even a really beautiful wooden collector’s signature box. 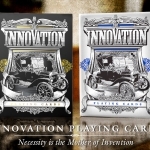 The cards will be printed in a limited edition of 1200 units by the USPCC in high quality Bee paper. The campaign is almost funded so if you want to make history, visit the project website and raise your pledge.